From closed to open source; from individual to community, it’s been a long journey and we have arrived here in 2016, getting ready for COSCUP. As well as continuing our long-standing spirit of “sharing”, we hope to extend and expand this mission further and to a wider audience; so it grows into a force that makes for a better future. This year we are focusing on the passing of the torch, and grassroot and interdisciplinary action. We hope to share and pass on knowledge gained so far so that it may become a foundation for brilliant ideas to come; to encourage a constellation of small ideas to gradually form and shine in their own right; and to help the myriad of different discplines come together and erupt into beautiful sparks of genius. Not only will there be our usual program, here at COSCUP you can find workshops suitable for all ages, unconfs, BoFs and numerous activities to take part in. Let us all look forward to this summer festival of fun, I hope to see you there! Want to do something in the spirit of Open but don’t know where to start? As well as coming to COSCUP in person, you may consider donations that will help it run smoother. 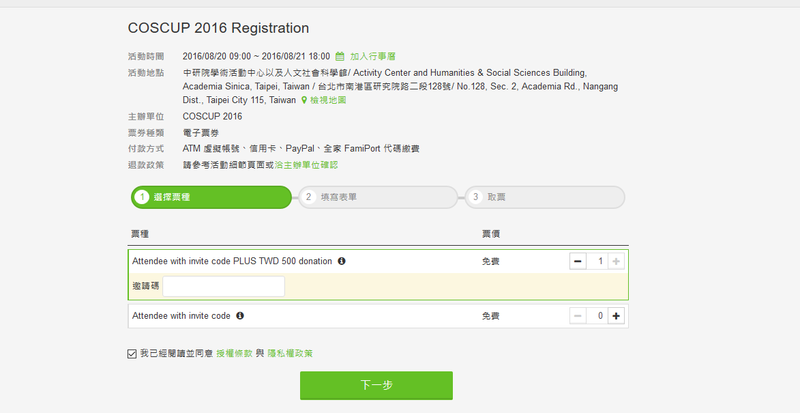 Donations are in units of NT$500; if you feel like doing so, please choose the “Plus TWD 500 donation” type of ticket (as shown below). Thank you for your consideration.